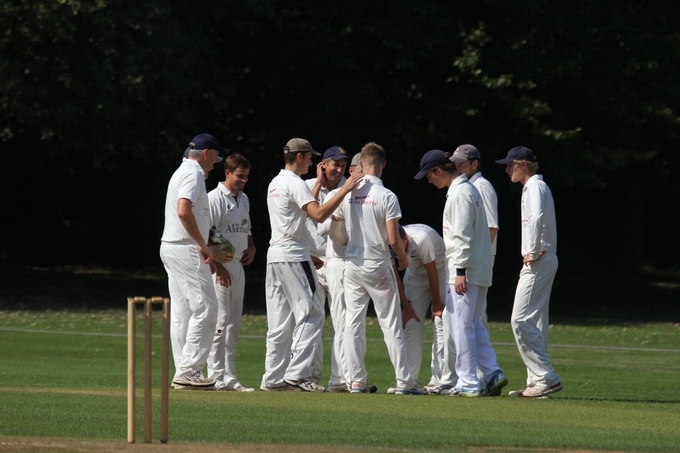 The Second Team celebrated promotion to Division Two by strolling to a nine wicket win over bottom placed Sonning. Set a target of 137, victory came when Jack Rodnight straight drove the first ball of the 22nd over for four. A win by ten wickets looked likely as Richard Ambrose and Solly Woodall amassed 128 for the first wicket. Ambrose was particularly severe on anything outside the off stump as he cut the ball powerfully through cover on numerous occasions. When the ball was a bit shorter and straighter he lofted it over mid-wicket. Solly Woodall played positively with shots all round the wicket before he was out LBW four short of a half century. Sonning’s innings got off to a poor start as both openers gave catches to Toby Wastling as they played extravagant shots, the first off Lawrence Snookes and the second off Jake Seagrave. An injury to Wastling’s knee resulted in the bowling being re-jigged and Rodnight being brought into the attack in the twelfth over. He uprooted Duncan Parr’s off stump in his second over and took three wickets in six balls in his fourth and fifth overs to reduce Sonning to 67 for 6 and finish with 4 for 29 from seven overs. Ash Haw found considerable turn, conceded just 26 runs form his ten overs and was rewarded with the wicket of Dave Rintoul. Charlie Greer took wickets in his first and second overs and then brought the end to Sonning's innings with the first ball of his third over thanks to an excellent catch in front of the sight screen by Dan Plumeridge.